OMAHA, NE. – The Sacramento River Cats’ franchise-best 13-game win streak came to an end Sunday night, as the Omaha Storm Chasers topped the River Cats 4-3, handing them their first loss since August 8th. Despite tying the game late, Sacramento was unable to overcome three Omaha home runs as they dropped game one of this four game series. Sacramento’s 13 straight wins is just one short of tying the Las Vegas 51s for the longest Pacific Coast League win streak since 2005. The 51s won 14 consecutive games this season, spanning from April 23 – May 7. 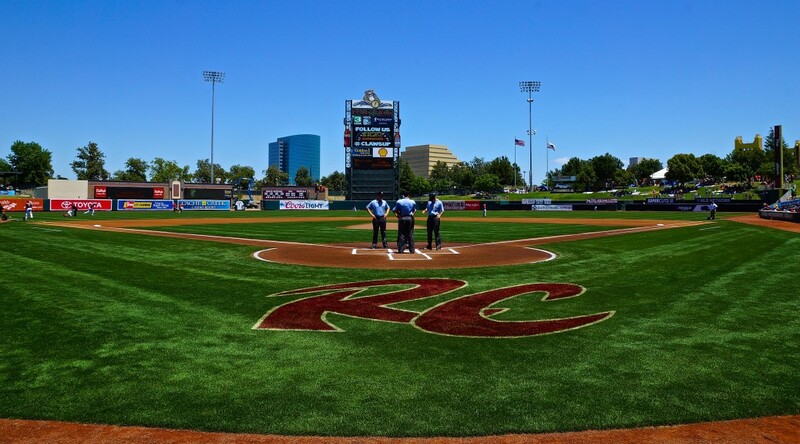 After an hour game delay, the River Cats wasted no time getting on the board Sunday evening. Darren Ford drew a walk to lead off the game, and Jarrett Parker’s ground-rule double drove in Ford with the first run of the night. Sacramento battled back and forth with Omaha for control of the game, keeping the score close with runs in each of the sixth and seventh innings. Jarrett Parker and Mac Williamson continued to shine, each with two hits and an RBI on the night. Williamson’s multi-hit night is his 11th since joining the River Cats in late June. The duo are hitting a combined .398 (35-for-88) over their last 10 games with five home run, 24 RBI, and 23 runs scored. All of Omaha’s scoring in tonight’s game came from home runs. Blasts from Jose Martinez, Reymond Fuentes, and a rehabbing Alex Gordon were all the Storm Chasers needed to top the River Cats. Gordon’s two-run homer in his third rehab at-bat in the fifth snapped a 1-1 tie between the teams. Martinez’s game-winning home run in the eighth inning also broke a tie, propelling Omaha past Sacramento. Jake Dunning had a rough outing, lasting only four innings on the mound. He allowed three runs on eight hits and one walk with one strikeout. Most of Dunning’s trouble came in the fifth inning when Omaha led off with three consecutive hits, including Gordon’s two-run home run. Dunning was pulled with a runner on base and without having recorded an out. Brett Bochy picked up where Dunning left off and got the River Cats out of the inning without any more damage. Bochy retired five consecutive batters and six of the seven he faced. Curtis Partch, who gave up the game-winning home run, picks up his third loss. Game two of this four game set will bring Chris Stratton (3-4, 3.78) to the mound for the River Cats. Stratton took a no decision in his last start, tossing four innings and allowing three runs on four hits and four walks while striking out four. All three of his wins have come on the road, where he is 3-2 with a 3.19 ERA. He is 3-1 in his last four starts with a 4.76 ERA. The Storm Chasers will counter with Andy Ferguson (4-3, 3.54). First pitch is set for 5:05 p.m. (PT).